Below is the released transcript from Housing and Urban Development Minister Phil Twyford to the recent Urbanism Conference held in Wellington on Monday and Tuesday. The rather silly $850 conference attending fee aside (which gives rise to equity issues) I was keeping somewhat of a tab on the conference and felt very confused. From the first speaker that was from Sydney promoting that we should protect heritage, limit height and scale (so basically defies the concepts of the Unitary Plan) to others either not realising (?) the Auckland Plan and Unitary Plan set out clear specifics on what and how Auckland develops (hence we need an Urban Development Act) it seems things ended up in a muddle. I want to thank the organisers of the conference Wellington City Council and the Urban Design Forum. It could not be more timely. We are at an exciting moment. The planets are aligned. If we grasp the opportunity we have the chance to change the way this country thinks about our build environment, our homes, the public and private realms, and our towns and cities. Humanity is undergoing a transformation. Instead of living close to the land, we are choosing to live close to each other. This is the Urbanisation Project. It started around 1800 when about 56,000,000 people living in cities. It will finish around 2100 with about 6 billion people living in cities. In NZ we are already there. The great irony of our agrarian national mythology is that we are highly urbanised. And yet we have never really embraced the city. We are only now beginning to grapple with density – the very essence of the city. All the contemporary symptoms of the urban problem – homelessness, a punishing rental market, cold damp homes, traffic gridlock, unaffordable housing, social isolation, crumbling infrastructure – reflect our collective fracture to understand how cities work and invest in their success. These reforms are underpinned by the insight that you must at least from one angle understand the city as a market, and pay attention to how it behaves, and intervene when necessary, otherwise you get some pretty perverse outcomes. The second insight is that a city designed around the needs of people rather than the car is a happier and more successful place. 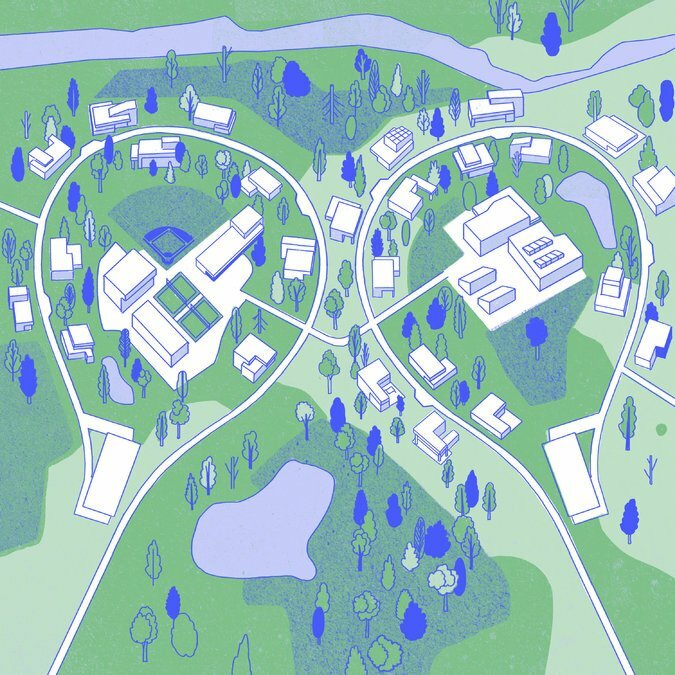 Our cities are to a large extent the product of a particular economic, social and spatial model from the 1950’s: The nuclear family living in a single-storey standalone home with a garden, connected to other suburbs by motorways, with a heavy reliance on the private car. The failure of the car dependent city is plain to see, here and around the world. Which is why our Government’s transport policy puts a great deal more emphasis on public transport, rapid transit, walking and cycling. We believe cities of any scale cannot be liveable or prosperous without modern rapid transit and plentiful opportunity to get around on foot and by bike. We also believe transport drives urban form so we take a joined up approach to transport, housing and urban development. We must invest in transport to drive the urban form we desire. In Auckland, with the Council and Auckland Transport, we recently landed a 10 year fully funded $28 billion transport plan, and we are about to roll out light rail. We also have a plan for Wellington. Investing in modern urban transport to support growth and give people the transport choices they want. The third big area of reform, and I concede it is the least developed, is unleashing the power of great design. It is time for a qualitative shift in how we design our cities. Good design is not some nice to have. It is not some pretty veneer. Good design is stuff that works. And because form follows function, stuff that works is so much more likely to please the senses. Good design has in the last two decades shown us, with the Wellington waterfront and Pukeahu National War Memorial Park and in Auckland, the Britomart and Wynyard Quarter – how the quality of the public realm can lift our spirits and make a city liveable, and that in turn attracts people and investment. We need good design to help build houses that are affordable, warm and dry, without compromising liveability and giving people great spaces to live in. We can draw inspiration from the successful efforts of the first Labour Government to lift the standard of the housing stock through its mass house building programme, and in the decades that followed a tradition of modernist New Zealand architecture. Now is the time to apply that tradition to housing for all of us, not just high end bespoke architecture. In the same vein of democratising design, we should be applying great design in our forgotten suburbs and small towns – not just on the waterfronts and downtowns of our biggest cities. Porirua and Invercargill deserve great built environments too. I am conscious as Christina van Bohemnen has reminded me that while we have been going hell for leather to set up Kiwibuild and start building homes, we haven’t yet done the work on design standards and how exactly we use a mass procurement programme like Kiwibuild to lift design standards. That is work we must now do. Good design is also the key to doing density well. Designing the spaces in between our homes will help us build desirable liveable density and it’s probably the only thing that will ease the fears of the NIMBYS. I want to mention Zavos Corner not far from here in Mt Victoria as a great example of medium density suburban design. It’s odd you know. We are only contemplating the kind of density Sydney has had for 50 years, and yet for some people it’s a scary thing, even though when we visit Sydney we love it’s urban feel. Finally, good design meets digital technology and industrialised production to give us the best opportunity to shake up and disrupt the residential construction industry. I’m talking about modern pre-fab, off site manufacturing. It’s a happy coincidence that the very policies we need to make our cities more liveable and economically efficient (more public transport, more walking and cycling, better thermal efficiency in our homes, more intensification) are the same policies that will reduce our carbon footprint and help us become carbon neutral by 2050. So we have an opportunity here. But to be honest, government doesn’t have much capability in this area. One of my jobs is to build capability and expertise in the public service for urban development, urban design and the built environment. We do however have the political will to work with you – the private sector, the design practitioners, local government, academia, the campaigners and advocates. It is not too late to start. 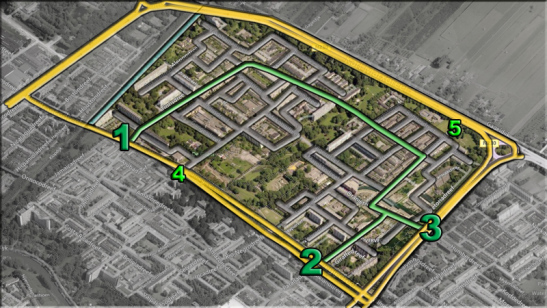 The new grid with the neighbourhood ring in green. In grey the 30km/h streets. Number 1, 2 and 3 indicate the main points where traffic can get from the arterial roads to the neighbourhood ring. Number 4 is the blockade that was cancelled. Number 5 is the blockade that is planned to be implemented at a later stage. There are no other points where motor traffic can access the neighbourhood. Auckland and New Zealand has struggled with this but we are making headway. Urban Geography: The Ultimate Expression in Inter Regional Spatial Planning, Developments and Behaviours which looks at inter-regional spatial planning and behaviours around it. Urban Geography, Urban Planning, Urban Design and Engineering: We are in a Mess Folks which looks at how we landed ourselves in the mess and how we can answer Twyford’s statement on Design mentioned above. I can’t wait for the Housing Commission – the central Urban Development Authority to fire up (though needs to be quicker than the 18 months Twyford said it would take to establish) and get going on some large urban developments especially in Southern Auckland and the northern Waikato!